Subtle control with 'soft knee' compression more compression effects when pushed hard. Elma switches for gain and threshold controls. Alpha switches for attack and release controls. All Mullard and Siemens NOS valves. More gain than earlier Master Phoenix. 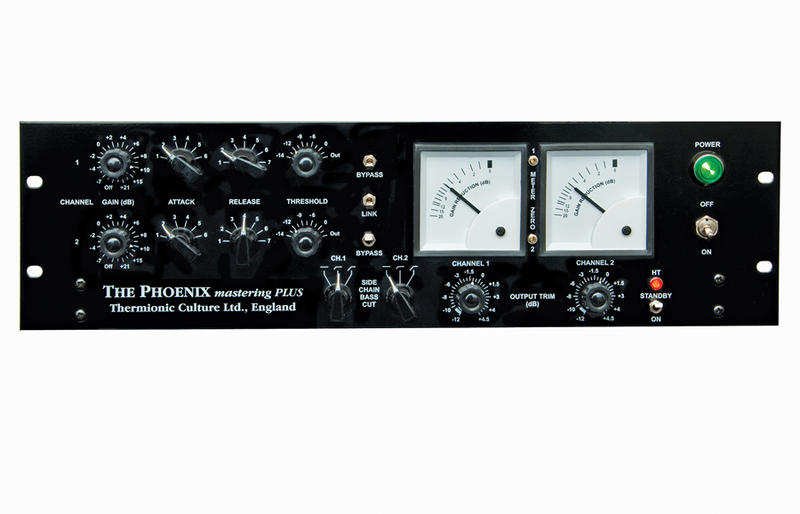 This is the latest development in the evolution of the classic Phoenix compressor, first introduced in 1998. 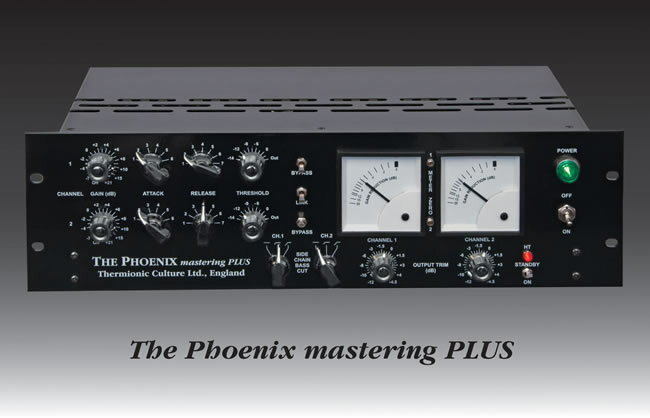 After requests from mastering engineers the Master Phoenix was introduced in October 2006. This was more recall-able with indented pots and slightly different power supply and metering circuit, in which trimming the meter alters the current through the compression valve so compensating for valve ageing. The compression curve of the mastering Phoenix is slightly gentler than that of the standard one, but it does have a more "positive" effect. This earlier version has 6dB lower gain compared to the standard Phoenix. The Master Phoenix is in use in many studios and mastering suites around the world, and we do know that one of its users, Ray Staff of AIR London Studios won the MPG award for Best Mastering Engineer in 2009. The new Mastering Plus is a much upgraded version employing precision Elma switches for the Gain and Threshold and Alpha switches for Attack and Release. Omeg indented pots are used for the Output Level for fine control. 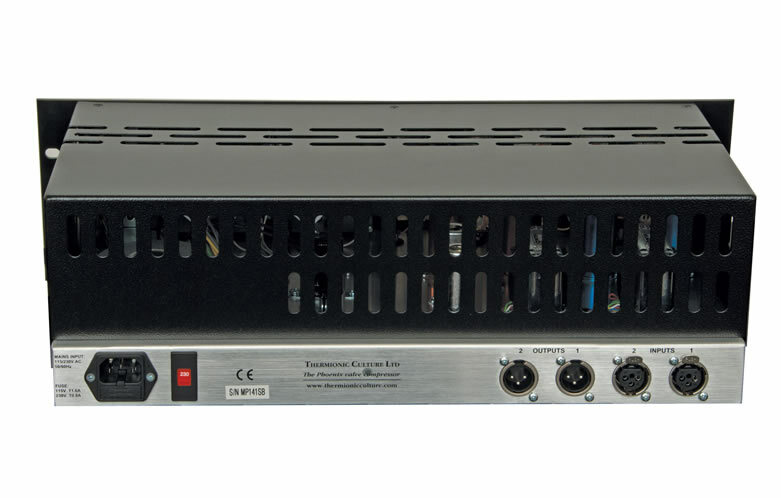 Side Chain Bass Cut switches, which have become an essential mastering tool have been retained. In stereo mastering, with the link switch in, there are effectively 5 frequency options as the compressor side chain will work at the average of the switch positions. Mullard and Siemens NOS valves are used exclusively for lower noise and long life stability. The Gain is now identical to that of the standard Phoenix so that extreme compression effects are possible . Easy adjustment of Meter Zeros, especially important in stereo mastering, is now enabled by front panel access to the trim controls, situated between the 2 meters. *some users have found that analogue tape type distortion is created when the unit is operated with Standby on.This was unintentional but some people may find it interesting.